The color of this truck is red trimmed with silver mirrors and chrome. I don't drive very far from home. To the store or church is as far as I will go. Its big and I want to get a smaller car when I am able. It has been a good truck. The color is red. I want something that I can handle better. Overall it has served its purpose. I am a grandmother and great grandmother that love her family. Yes, I will pick up the grandkids from school sometimes too. It has only had a few minor problems down through the years like brakes. The paint job on this truck has held up good. The passenger window is stuck and will not go down. I had to buy a set of tires one year. I bought this truck back in 2005. I think Chevrolet is a good brand. My daughter drove it a few years. I had a bump with a person coming out of taco bell one night. I don't drive at night because I can't see well. I didn't see this black car that was coming in as I was coming out. It only scratched up the front bumper of the truck but his car had a dent in the door. It is a strong truck and it is made very well. Overall I have been very happy with this truck. When the time's right I will trade it in for a smaller car. 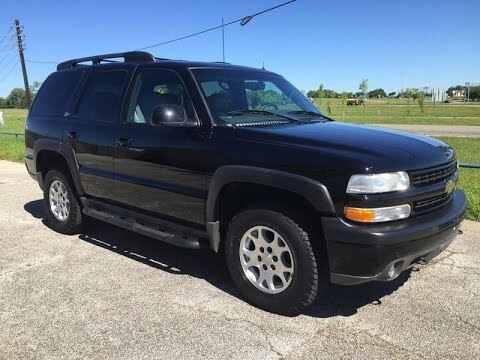 02’ Chevrolet Tahoe: Chevy’s tank. The car is seemingly unbreakable. Made very well and has not given much issue though it is at almost 250, 000 miles. We have had to change tires and have them rotated but that is normal. Gas mileage is my only complaint. As it is an older car, the fuel efficiency has gone down. I am getting more or less 12-13 miles to the gallon. As an everyday vehicle, this can begin to add up. If it is used more as a when needed SUV, the use is much greater. That being said, even at its age and everything it has gone through, I recently drove it on a seven hour trip to Dallas. The car had zero issues there or back and I made it there on one tank of gas. Highway miles it does great. The capacity of the tank is great too. It holds around 25 gallons. It is also easy installing new speakers and wiring subwoofers in the vehicle. We changed everything out with little difficulty. 02 Chevy Tahoe, a great vehicle! Great vehicle! Following the user manual is the most important aspect of most vehicles, this remains the same for this one. The only issue that arose a couple time is the check engine light, which usually indicated a sensor issue, minor repairs was the only requirement. The only other aspect that a user may find difficult is dropping the rear passenger seats. There are no actual levers visible only the spring mechanism, a rather crude design. I had to look up how to drop the seats on an online forum because the manual covers multiple model types. Other than that I recommend this vehicle to anyone!